Residents of a typically quiet apartment community in Ashburn, Virginia, were startled Saturday night by gunfire and say one bullet nearly struck a 6-year-old girl. Loudoun County sheriff's deputies responded to The Grove at Flynn's Crossing on Blossom Hill Terrace about 9 p.m. They said several rounds struck an apartment building, damaging some of the walls. 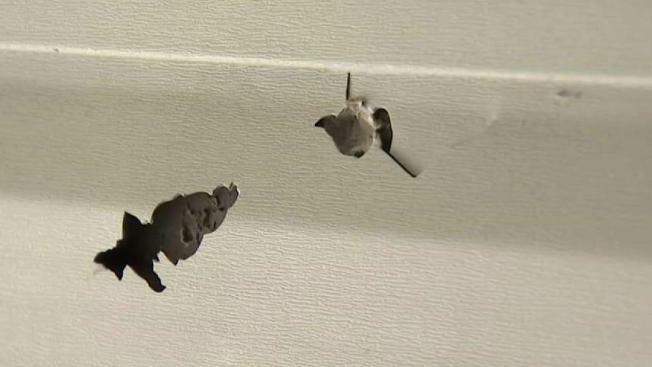 One bullet flew straight into a second-floor apartment, through the clothes dryer and lodged in the dryer door — just feet away from where a girl was inside. A resident of the apartment said the child heard the bullet blast through. "Fortunately, nobody was injured, but it can me pretty dangerous and deadly. So, it really is a big concern to us," Loudoun County Sheriff Mike Chapman said. Deputies went door to door to get information from residents. One woman said she was inside with her 6-year-old son when she heard the gunfire. "I heard that, you know, big noise, like, boom!" she said. One man thought he had heard a firecracker until police knocked at his door. "Now that I know that you found the holes, it's kind of making me feel like I'm not safe. I didn't even get any notifications from my landlord so it's kind of weird," resident Laith Abdulazzeez said. Chapman says investigators are trying to determine the exact target. Security cameras did not capture video of the suspect or suspects. Chapman says the shooter may have fled in a silver sedan.